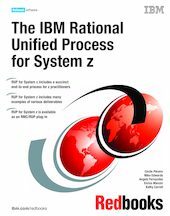 This IBM® Redbooks publication describes the new Rational® Unified Process® (RUP®) for System z™ method, which has been especially created for use by organizations that are involved in developing applications software in the System z environment. Developing applications software in the System z environment has been going on for many decades and generally during this time, traditional development life cycle methodologies have been applied to the development process. With the current environment of businesses needing to be more agile, on demand, and flexible to user needs, pressure is on IT organizations to respond in as agile and flexible a manner as possible in order to satisfy user needs with precision and quality. RUP is based on proven development principles and contains best practices for developing software. This specific adaptation of a modern best-of-breed methodology, RUP for System z, will provide you with a development process that has already yielded much valued benefits to software development practitioners in other platform environments. This IBM Redbooks publication demonstrates the use of the RUP for System z method by using as a case study an application development example. It provides you with actual example work products produced during the various lifecycle iterations and phases, so that you are able to more easily understand the iterative and incremental nature of application development and its associated benefits. The new RUP for System z is also available as a Web site for easy reference through a Rational Method Composer (RMC) plug-in. This book shows you how to download and install the new RUP for System z plug-in, and furthermore, will help you configure it, if necessary, to suit your own application development environment in order to enable your team to derive the utmost benefit and add value to your development activities. See the Additional Material selection choice on this Web page. This IBM Redbooks publication is intended for the whole of the System z application development community - from beginners to advanced practitioners, for roles ranging from project managers, architects and designers, to programmers and testers alike, because it covers the full end-to-end development lifecycle for the System z environment. In addition, System z Development Managers and Method Designers in particular might find this book useful as a ready reference guide.